Many patients choose to have a laparoscopic (keyhole) repair of their groin hernia, and some patients, with recurrent or bilateral (both sides) hernias, should have their hernias repaired using this technique. The operation has to be performed under general anaesthetic (with you asleep). Extra local anaesthetic is injected around the scars to reduce post-operative pain. The specialist will make a small scar next to the umbilicus and inflate the abdomen with gas. This creates a space in which to work, underneath the muscle, but outside of the abdominal cavity. This is called a TEP repair. 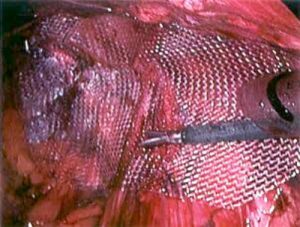 Two tiny additional cuts are made to allow the laparoscopic instruments to enter the abdomen and to place the hernia mesh. About a quarter of men will develop hernias in both groins (bilateral inguinal hernias). A proportion of hernias will recur after previous traditional surgery. These are called recurrent hernias. When patients have bilateral hernias or recurrent hernias the specialist will normally suggest that a laparoscopic (keyhole) repair is the best option.